Curse you Annie Lennox! I know it's good for the flowers and plants and trees and veggies - but enough is enough. We should have some sun for the upcoming weekend though. Something to look forward to. Today completes the first 2 weeks and I weighed 184.4 lbs on the scale this morning. That's a 13.6 lb loss - right on target. Feeling pretty good. I have a nice reserve of fish for the next several days and my rice supply is still substantial. However, the asparagus forest is starting to thin out. It has been such a productive crop but that only goes so far before over harvesting takes its toll. I'm going to have to start branching out in the veg department and nothing else seems to be cropping up right now in the garden. I didn't pre-plant a bunch of lettuce, collards and chard like I had done in years past and right about now that kind of plant would be ready to pick. Poor planning on my part. Stupid. I should be smarter than that. Last night I spent a lot of time butchering that nice big striped bass that had been on ice for a day. With the exception of the head and tail, I think I made pretty good use of just about every part of that fish. My first meal from it came in the form of the carcass and spine - which oddly enough reminded me of making bbq ribs on the grill. I grilled the bones and brushed on some honey and salt and when it was finished it was quite delicious. There is a lot of meat left on the bones after the fillet process. Most of this is usually discarded by fishermen (myself included). But not this time. I ate it like a slab of ribs and picked every bone clean. It had a nice hint of sweetness thanks to the honey glaze once again. I have been anxiously waiting for an opportunity to break out the smoker grill and I finally had enough fish to get it going. Yesterday I filled a zip top bag with a honey, salt and water solution and into it I added several strips of fish. After brining overnight I removed the fish and set it on the dehydrator to dry for a hour or so while I got the wood chips smoking on the grill. 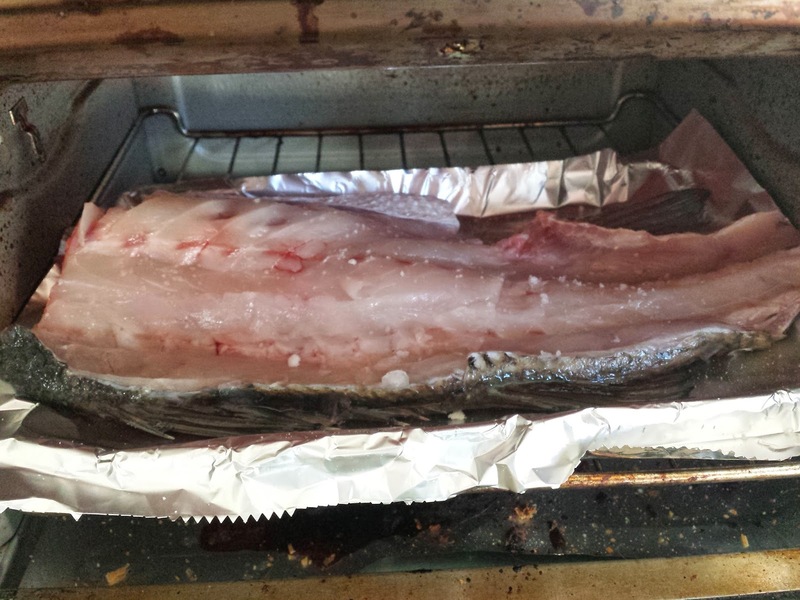 Ideally I would have dried the fish longer in order to form a nice sticky pellicle for the smoke to adhere to. I was a little hasty due to hunger so I shortened the drying time from 3 hours down to 1. I got the chips smoking nicely when the fish arrived. I really feel as if I am getting better at this process every time I do it. The fish smoked for a few hours and then I went to bed with it on the dehydrator for it's final drying cycle. I set a timer to automatically shut off and when I woke up in the morning there was an odor of smoky deliciousness coming from downstairs. In hindsight I probably should have done the final step in the garage to avoid disturbing the rest of the family. I should have a nice supply of fish jerky for several days. And I can reuse the brine solution a few times before it gets old. I'm looking forward to some smoked bass. Yum.